Thomas Jefferson was a driving force behind the original U.S. Public Land Survey and today, April 13, is his 272nd birthday. Farmland in Jefferson’s home state of Virginia, near Monticello. Irregularity reigns. The border between northeast Ohio (left) and northwest Pennsylvania (right). Emphasizing secondary roadways, this map shows the influence of surveying methods based on the cardinal directions (Ohio) or lack thereof (Pennsylvania). The landscape near Lebanon, KS (bottom left), the geographic center of the contiguous 48 states. Most visible are quarter sections, half a mile on a side and 160 acres - a quarter of one square-mile section. Different plantings and roads along section lines make these regular units especially clear. A street map of Los Angeles, revealing a stark difference between lands that were subject to the survey (conducted in the 1850s) and those that were not. Downtown (on the right) retains the grid of the original Spanish pueblo, while the streets to west are oriented according to the baselines and meridians of the Public Land Survey System. So next time you hop on a plane, grab a window seat and see if the legacy of the land survey shows through below. How Do Michigan's Parcels Work? When gathering every single parcel possible and putting it into the LOVELAND Explorer, sometimes you need to gather a few people (or an entire state) around a table. Several states already have either a fully developed statewide parcel data layer (New Jersey, Montana), or are presently curating and offering informational resources towards statewide standardization (New York, Massachusetts). LOVELAND thus turned its attention towards its own local home state of Michigan. LOVELAND partnered with a group of students from the University of Michigan's Social Venture Fund (SVF) at the Stephen M. Ross School of Business to conduct a survey of Michigan's parcel data accessibility, cost structures and overall maintenance practices. 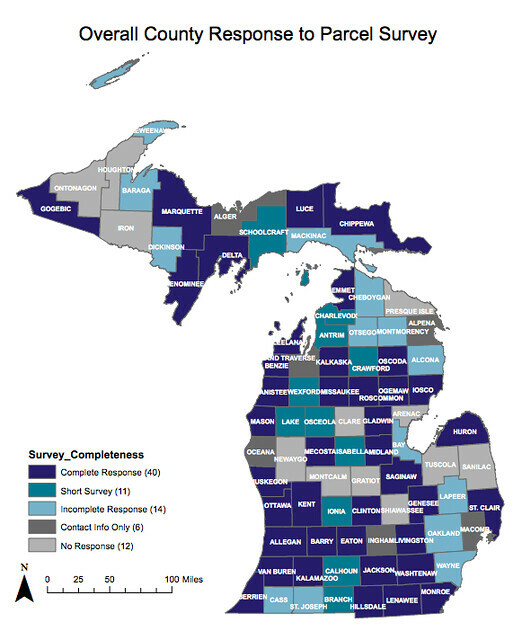 Along with support from Michigan's Office of Technology Partnerships (OTP), SVF students administered an online survey to county assessors, GIS departments, and vendors who maintain parcel spatial data for Michigan counties and municipalities. The results are linked below in a pdf. The hope is to continue on with this preliminary step and bring action within Michigan towards creating a free, accessible and well maintained parcel dataset of all properties within the state. • Does The County Maintain Digital or Manual Parcels? • Which Department Maintains Parcel Shape Objects? • How Often are Parcel Shape Objects Updated? • If County Maintains Assessment Data, How Often is Data Updated? • If Cities and Townships Maintain Assessment Data, How Often Does County Recieve Updated Assessment Data? • Can County Attach Assesment Data to Parcel Shape Objects? • Is There a County-Wide Complete Parcel Data File? • Does the County Maintain Parcel Metadata in Conjunction with Parcel Shape Objects? • How Often is Metadata Updated or Reviewed for Accuracy? • Can the Public Access Parcel Shape Objects? • Can the Public Access Assessment Data? • Can the Public Access Complete Parcel Data? • What is the Cost of County-Wide Parcel Shape Objects? • What is the Cost of County-Wide Complete Parcel Data? • What is the Cost of County-Wide Assessment Data? • Is There a Cost for an Annual, County-Wide Data Update? • Is There a Cost for a Bi-Annual, County-Wide Data Update? • On Average, How Many Sales are Made Per Year of Complete Parcel Data? • On Average, How Many Sales are Made Per Year of Parcel Shape Objects? • On Average, How Many Sales are Made Per Year of Assessment Data Only? • What was the Total Revenue from Data Sales in 2014? • On Average, How Many Annual Data Updates Does the County Sell? • When Was the Current Data Pricing Model Enacted? • How Often is the County's Data Pricing Reviewed? • Does the County Provide Free Data Access to Certain Groups? • Does a Vendor Collect and/or Maintain Parcel Shape Objects? • Does a Vendor Collect and/or Maintain Assessment Data? • Does the County Have an Open Data Policy? • If the County Does Not Have an Open Data Policy, is the County Currently Working on One? • To your knowledge, is the county engaged in conversations to participate in the state-wide open data policy? • Are You Interested in a State-wide Parcel Layer? Now go read the whole thing! And let us know if you have any questions or ideas at team@makeloveland.com. You’ve likely already seen the staggering numbers when it comes to people facing foreclosure in Detroit. But here they are again: in 2015 around 62,000 Detroit properties were given tax foreclosure notices by Wayne County, including 37,000 occupied homes. Each of those numbers represents a person with a story. It’s easy to ignore the human side if you don’t have to look into the faces of actual people being affected. We make a lot of assumptions about who those people might be. After spending a week at COBO Hall for the Show Cause hearings and attending various foreclosure counseling meetings in different neighborhoods around the city, I can tell you first hand, that for every person who came though, there is a distinct, unique set of circumstances that put them at risk for foreclosure. Not one time did I ever encounter a person who had the money and CHOSE not to pay their property taxes. Most of the stories involved a loss of income associated with some sort of illness or injury that prohibited the individual from maintaining employment. That set of circumstances led to tough decisions where choosing between paying property taxes and necessities like electricity, phone bills, transportation cost, child care, etc. were a regular occurrence. Dabls' Beads from Loveland Technologies on Vimeo. The first is our friend Olayami Dabls--esteemed fine-artist, museum curator, and historian, who has lectured extensively on African Material Culture to international audiences for over 30 years. As a curator, Dabls is a founding member of the African American Sports Hall of Fame, housed in the Wayne county building. He was also Artist-in-Residence at the Museum of African American History (1973-1982) as well as at the Detroit Psychiatric Institute (1985-1989). Dabls has served as Executive Director for the Rosa Parks Arts Center (1982-1984) as well as produced and hosted a radio program on WNEC4 (1978-1981). Well, it finally happened. LOVELAND has gone Hollywood. Thanks to our friends at Detroit Lives! we have a snazzy tiny movie for our new site and The Great American Parcel Survey. As background, the theme of the video and survey developed after reading "Measuring America: How the United States Was Shaped by the Greatest Land Sale in History" by Andro Linklater. The book tells the surprisingly little-known story of the original US Public Land Survey which followed Thomas Jefferson's idea to grid the country into perfect square mile sections and six-by-six mile townships. These plots were then sold, further subdivided into parcels, developed, and incorporated into counties and states. They attracted immigrants, funded the young country, and literally set the stage for American democracy. I found it so deeply fascinating that I bought a copy for everybody on the LOVELAND team, and highly recommend reading it. "American democracy was less a product of revolutionary war and constitutional ferment than it was of a particular way of measuring land, argues British historian Linklater in his delightful new study. Private ownership of land was a new concept in England in the 17th century, one that was grounded (so to speak) in the developing science of surveying, in particular, Edmund Gunter's simple new surveying system of squares and grids. But the idea that land could "be owned as a house or a bed or a pig was owned" was central to the new United States. Thomas Jefferson and others contended that property belonged to those who could purchase it and labor upon it. Thus, when the land west of the Ohio River was purchased by the United States, a new wave of settlers headed there with the intention of owning their own patch of land. Before the land could be sold, however, it had to be measured in roughly equal plots, and the surveyors used Gunter's method of drawing the boundaries of land in square miles. Linklater's detailed chronicle of the physical development of early America demonstrates the ways that the desire to own private property grew out of the individualism of the frontier and shaped the peculiarly American notion that the individual's right to property is both a foundation and a guarantee of democracy." As you explore the country with LOVELAND, you'll see evidence of the original square mile survey absolutely everywhere. If you live in America, you live in its echo, and its constraints literally shape your world. We hope you find the notion of resurveying America to see what we've become as exciting as we do. Please try it out and let us know what you think at team@makeloveland.com or on Facebook or Twitter.